Borneo Exotics in Sri Lanka typically only exports immature plants with leaf-spans ranging from 2″-8″. However, a few months ago they announced that they would make some of their larger “specimen” plants available. Importing anything but smaller plants tends to be more trouble than it’s worth: They take up more space, cost more to ship, are more prone to damage in-transit, and they also experience much greater transplant shock than smaller plants. Larger plants also seldom fetch proportionately high prices in today’s collector market. However, when I saw this particular hybrid, I decided it was all worth it. While the absolutely spectacular Nepenthes robcantleyi is very new to cultivation and therefore has yet to be proven as a good hybridizer, Nepenthes talangensis has consistently produced some of the best hybrids around. I reasoned that if any mate could bring out the very best in N. robcantleyi, it would be N. talangensis. Plants of this size take months to resume normal growth as they re-establish, but I’m sure this will become an absolute show-stopper. I will be periodically featuring outstanding plants from our collection and the collections of our friends in “spotlight” posts. These spotlights will have information on the plant, its history, growing advice, trivia, and probably most importantly: lots of pictures. What better way to get started than with an absolute MONSTER? We received this seed-grown plant from Borneo Exotics in February of 2011 and it has been happily growing in our California greenhouse ever since. This plant stands head-and-shoulders above everything around it. 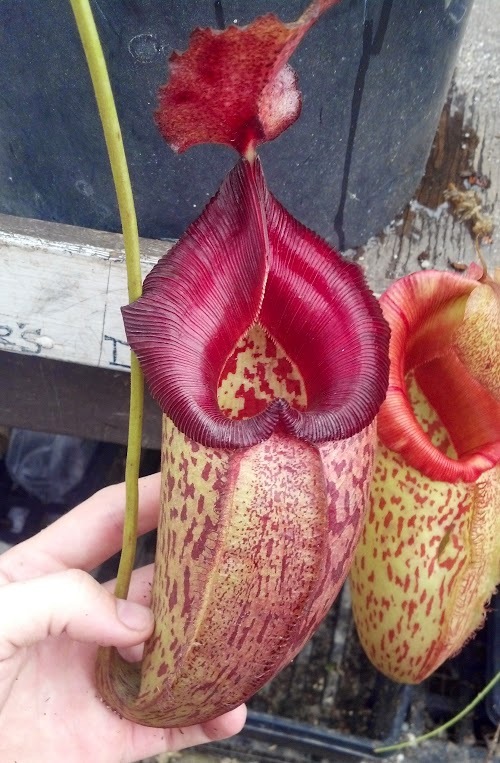 Without fail, every person who sees this plant knows that it’s something special, even if they have never seen a Nepenthes before. 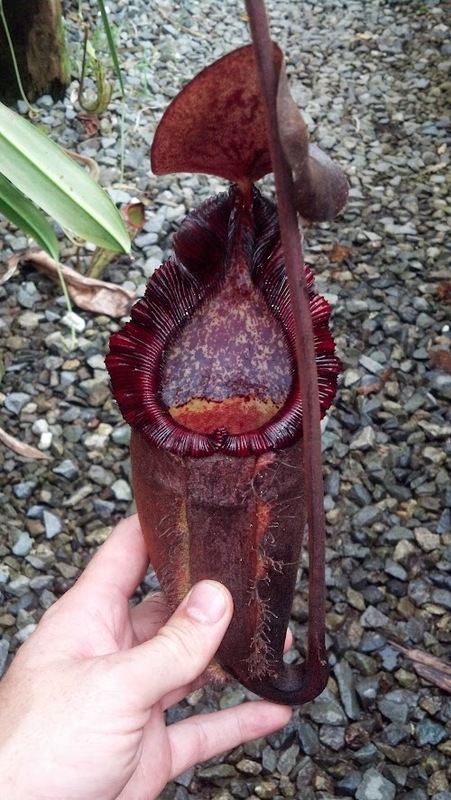 The lower pitchers are deep purple and brown and are covered in a velvety fur. 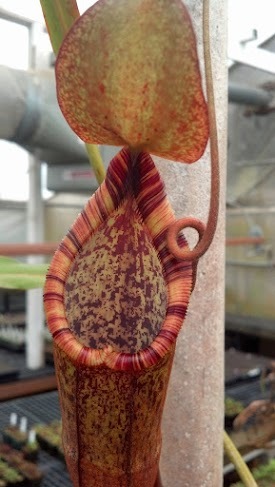 The peristome is probably the most richly colored of any Nepenthes we have seen, with a burgundy background and almost black stripes. 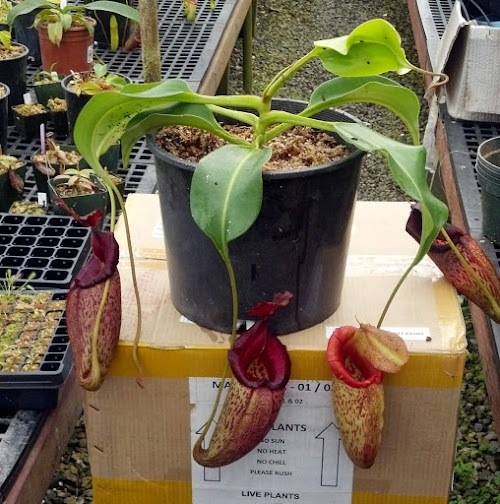 The spur on these pitchers is also very irregular, as it can be over 3 inches long. The tendrils are massively thick and also covered in hair, and the leaf-span is nearly 3 feet! Unopened lower pitcher. Notice the “fur” & super long spur! 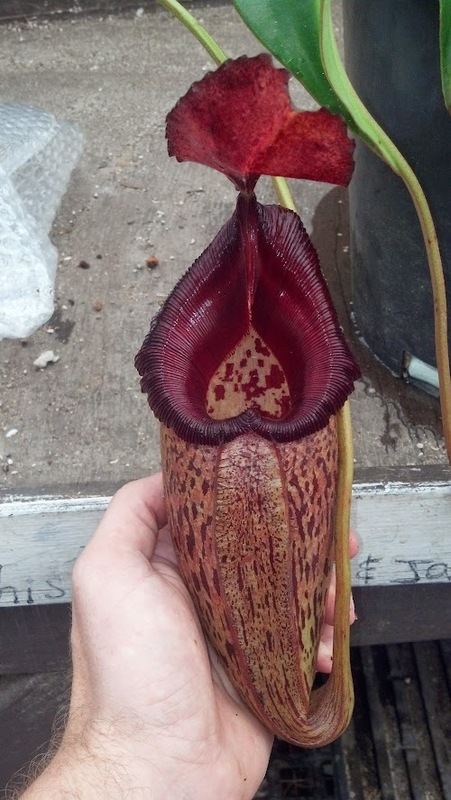 So far we have crossed this female with N. aristolochioides, N. ventricosa, N. mira and N. talangensis. Keep a lookout for these seed-grown releases in the coming years. Some interesting trivia: this particular specimen might end up being responsible for the very future of this hybrid in cultivation! I made a post about this plant on a forum last year. The pictures generated a lot of interest, including from Rob Cantley, the owner of Borneo Exotics and the man responsible for the hybrid. He sadly informed us that no more of these plants would be available because the tissue culture stock had been lost due to contamination. However, after taking another look, he discovered a few “lost” backup jars of this very cross in another location! This means that there should be more of these plants on the market in the near future. The full forum thread can be seen HERE. Obviously, I will be eagerly awaiting my royalty check for all future sales. 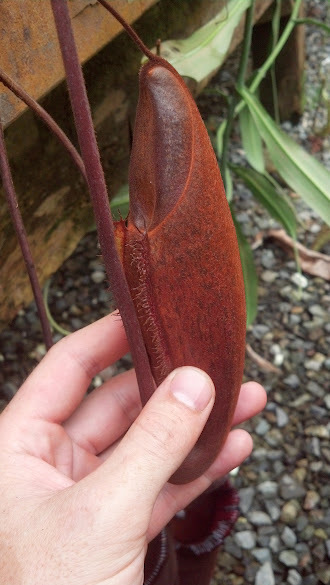 nepenthes densiflora x spectabilis "Giant"